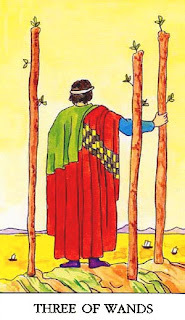 Weekend Reading: Three of Wands from the Radiant Rider Waite. This card is sometimes known as the card of "waiting for your ships to come in". A decision has been made or a plan has been put into place. You've done all you can do at this point. And you may be able to see results on the horizon. But it's out of your hands now. You have to be patient and let the results come in their own time. So if you're anxious for something to be over, be here or to otherwise reach its outcome, remember that it's out of your power now. You've done all you can do. So just distract yourself from the situation, if you can. Watched pots take a long time to boil. But if you can detach and trust, the results will be here before you know it.